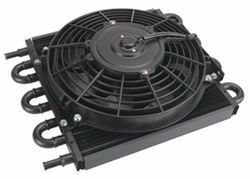 See the current ranking of the very best transmission coolers available. Voted by customers, confirmed by experts. The vast majority of automatic transmission failures are a direct result of overheating. And towing can place an extra strain on your transmission, causing it to get too hot. An aftermarket transmission cooler can help prevent overheating and extend the life of your vehicle's transmission. Even if you don't tow, keeping your transmission cooler can be beneficial. Even a relatively small drop in fluid temperature can almost double a transmission's life and increase its performance. Most factory cooling systems are adequate at best, rarely maintaining your transmission's fluid within the ideal operating range of 160 to 200 degrees. Adding a transmission cooler is not difficult and can extend the life of your vehicle and ensure that it functions at its best. The heat exchanger is the cooler itself, the core that works to cool transmission fluid. Learn more about the three basic types of heat exchangers, below. Most transmission coolers are designed to be mounted flush against either the radiator or the AC condenser core. For maximum cooling ability, the heat exchanger must receive the most airflow possible. Mount cooler between your vehicle's grille and the AC condenser core for the greatest efficiency. Mounting the cooler between the condenser and the radiator still allows for ample airflow, but cuts effectiveness by 25 percent. Installation of a larger cooler unit in this position may help make up for that loss. Mounting the cooler between your engine and radiator considerably decreases the available airflow and causes the cooler to be 40 percent less efficient than if you mounted it in position A. If you mount a cooler between the radiator and engine, you should install a larger unit to make up for that loss. We offer a variety of adapters, connectors, and fittings so that you can hook up a cooler to your vehicle no matter the model. 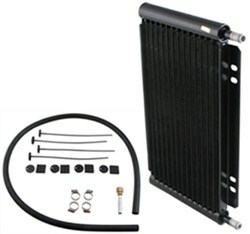 Most transmission cooler kits include hose, hose clamps, installation hardware, and a radiator adapter that can fit many transmission line connectors. In most cases, you won't need to cut or flare any lines to install a transmission cooler. 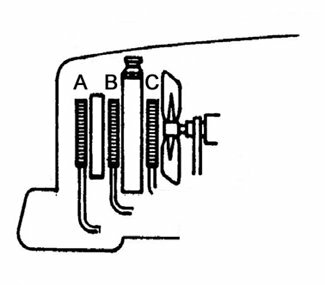 However, you may need vehicle specific connectors to install a cooler in some vehicles. Our fitguide can help you find a cooler with the proper connectors for installation in your vehicle. See Transmission Coolers confirmed to fit your vehicle. Many coolers can be used not only for transmissions, but for engine oil and power steering systems as well. A power steering cooler will extend the life of both the pump and seal, drastically reducing heat-related pump failures.